Oceania (UK /ˌoʊʃɪˈɑːniə,_ˌoʊsɪʔ/ or US /ˌoʊʃiːˈæniə/), also known as Oceanica, is a region centred on the islands of the tropical Pacific Ocean. 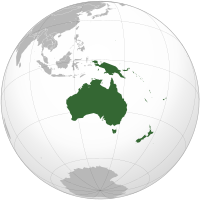 Opinions of what constitutes Oceania range from its three subregions of Melanesia, Micronesia, and Polynesia to, more broadly, the entire insular region between Asia and the Americas, including Australasia and the Malay Archipelago. ↑ Pronunciation: The New Oxford Dictionary of English (1998) ISBN 0-19-861263-X p.1282 "Oceania /ˌəʊsɪˈɑːnɪə, -ʃɪ-/". ↑ "Oceania". Dictionary.com. Random House, Inc. 2012. Retrieved 2014-03-08. ↑ ""Oceanica" definition". The Free Dictionary. Retrieved 2 April 2013. ↑ Son, George Philip (2003). Philip's E.A.E.P Atlas. p. 79. ISBN 9789966251251. Retrieved 2014-03-08. ↑ Scholastic Atlas of the World. 2003. "Oceania is the smallest of all the continents"
↑ Lewis, Martin W.; Kären E. Wigen (1997). The Myth of Continents: a Critique of Metageography. Berkeley: University of California Press. p. 32. ISBN 0-520-20742-4. ISBN 0-520-20743-2. Interestingly enough, the answer [from a scholar who sought to calculate the number of continents] conformed almost precisely to the conventional list: North America, South America, Europe, Asia, Oceania (Australia plus New Zealand), Africa, and Antarctica. ↑ ୧୬.୦ ୧୬.୧ Christmas Island and Cocos (Keeling) Islands are Australian external territories in the Indian Ocean southwest of Indonesia. ↑ On 7 October 2006, government officials moved their offices in the former capital of Koror to Melekeok, located ୨୦ କି.ମି. (୧୨ mi) northeast of Koror on Babelthuap Island.